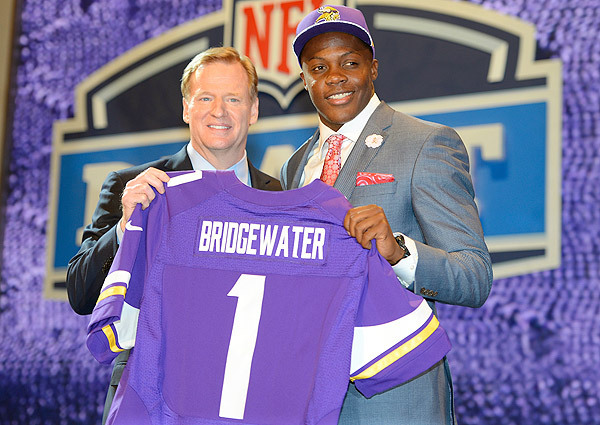 The Vikings traded back into the first round to land QB Teddy Bridgewater. With all 256 picks of the 2014 NFL draft in the books, it’s time to take a look at where things stand. Find grades and breakdowns for all 32 teams below. One thing is for sure -- if you're a receiver and you're facing Arizona's defense, keep your head on a swivel. Between second-year safety Tyrann Mathieu and 2014 first-rounder Deone Bucannon from Washington State, the Cardinals are looking to scare enemy offenses with their safeties. Bucannon plays at full speed and with killer intensity at all times, and if he ever finds his sense of direction, he's going to be even more dangerous. Notre Dame tight end Troy Niklas is a big blocker and burgeoning receiver who will take time to develop. North Carolina end Kareem Martin is a huge (6-foot-6, 272) defender who could back up Calais Campbell. Pittsburg State receiver John Brown will help take the top off enemy defenses. Virginia Tech quarterback Logan Thomas is a developmental prospect who might find his way at another position and Murray State receiver Walter Powell is a smaller slot man. Overall, the Cards added some targets and got meaner in the defensive backfield; two musts as they try to move atop the NFC West. The Falcons started their draft by getting bigger, stronger and more talented at their most pressing positional groups -- the offensive and defensive lines. First-round offensive tackle Jake Matthews should slot right in as Matt Ryan's blindside protector for the next half-decade. And on defense, Minnesota hybrid lineman Ra'Shede Hageman has the potential to play over multiple gaps on a line that has changed in scheme. Wisconsin safety Dezmen Southward is an excellent athlete who can move around to a few different roles, and Notre Dame outside linebacker Prince Shembo is an interesting developmental pass rusher. All in all, a nice haul for the Falcons -- if Hageman develops into the player he can be. From a strict talent-and-value perspective, the Ravens may have done as well as any other team in the draft. LB C.J. Mosley, if he's healthy, could be a Defensive Player of the Year frontrunner; DT Timmy Jernigan had mid-Round 1 potential, only to fall to pick 48; safety Terrence Brooks may be an instant starter. Baltimore also landed some of the better role players available, like TE Crockett Gillmore and underrated QB Keith Wenning. The lone knock here comes from Baltimore's inability to really address its offensive line. A gambler's draft. The Bills traded the No. 9 pick and two 2015 selections (first- and fourth-round) to Cleveland so they could nab WR Sammy Watkins, then traded Stevie Johnson away to San Francisco. That's all after they traded earlier for ex-Bucs WR Mike Williams. Oh, and they sent Philadelphia a draft choice for RB Bryce Brown. But for all that, their biggest risks came along an offensive line that needed some help. OTs Cyrus Kouandjio and Seantrel Henderson and G Cyril Richardson all are rolls of the dice. Safer selections came in Rounds 3 and 4, with solid LB Preston Brown and CB Ross Cockrell, respectively. At least one sure thing on the O-line would have been nice, given how Buffalo sacrificed to make itself a contender in 2014. Panthers general manager Dave Gettleman got some great value picks, though Florida State receiver Kelvin Benjamin went about as projected as the 28th overall pick. However, getting Missouri defensive lineman Kony Ealy with the 60th pick was a steal, if you believe the many first-round grades he had. Perhaps the best value Carolina got came in the third round, with LSU guard Trai Turner, a true mauler who fits the Panthers' power offense perfectly. Tre Boston is a nice-sized safety who will help in the defensive backfield, and Stanford running back Tyler Gaffney fits the Panthers' power prototype. They still need receivers, and Benjamin is an unfinished project, so it would be fair to ding the Panthers a bit because they didn't take advantage of such a deep wideout class. General manager Phil Emery hit a number of potential home runs, starting with first-round cornerback Kyle Fuller, who may have had the cleanest tape of anyone in this class at his position. Second-round LSU DT Ego Ferguson, though still learning the finer points of the game, should be able to stick at multiple spots. Grabbing Arizona State defensive tackle Will Sutton in the third round and Arizona running back Ka'Deem Carey should be a win for the team's Southwest area scout. Minnesota safety Brock Vereen actually projects pretty nicely as a slot corner at the next level, filling another clear need. Head coach Marc Trestman gets his developmental quarterback in David Fales, and Boise State offensive tackle Charles Leno Jr. projects nicely as a possible guard. After absolutely stealing CB Darquze Dennard at No. 24, it would have been hard for Cincinnati to screw this up too badly. The Bengals kept their momentum going with later selections of RB Jeremy Hill (likely a BenJarvus Green-Ellis replacement) and DE Will Clarke. Trading up for C Russell Bodine -- just the third trade-up in team history -- was an odd move, even though Cincinnati needed someone to push Trevor Robinson. Ultimate judgment of this class, no matter how unfair, may rest with the future of QB AJ McCarron. The first day of the draft may have been among the most exciting stretches in franchise history, what with a trade down and then two trades up, netting the Browns CB Justin Gilbert and QB Johnny Manziel. There was talent found after that, as well, namely versatile OL Joel Bitonio and CB Pierre Desir -- the latter a remarkable value at No. 127 overall. RB Terrance West is a sleeper. But Desir was Cleveland's final pick, and there was nary a receiver to be found among the previous five choices. For the second straight season, the Cowboys went offensive line in the first round -- but unlike Travis Frederick, Zack Martin wasn't a reach. The former Notre Dame tackle can be a fantastic guard with a little finishing work. Boise State defensive end DeMarcus Lawrence will try to replace a more prominent DeMarcus (Mr. Ware), and he has the nascent tools to do so, though the second round might have been a slight reach. Outside linebackers Anthony Hitchens and Will Smith will reinforce positions needed as Dallas tries to move intelligently to a 4-3 this year, and Baylor safety Will Dixon could be special as long as he stays out of trouble off the field and plays with a bit more discipline on it. Seventh-round Oregon cornerback Terrance Mitchell might be the sleeper here. Denver checked off several needs: CB with Bradley Roby, WR depth with Cody Latimer and LB with Lamin Barrow. The first two there dipped a slight bit on the board, so the Broncos could claim them as values. They need third-round pick Michael Schofield to pan out ... and preferably to do so at guard, where the Broncos are thin yet did not make any additions. Nothing too remarkable here, though both Roby and Latimer may develop into stars in the not-so-distant future. In past drafts, the Lions have not been afraid to reach up to get the players they want, and general manager Martin Mayhew was similarly bold with the acquisition of North Carolina tight end Eric Ebron. The talented pass-catcher was projected by many as a mid-round talent, but went 10th overall. Mayhew went back to the well in the fourth round with Bloomsburg tight end Larry Webster, a sleeper on many boards. Where Detroit may have picked up its best value is in their second-round pick, BYU linebacker Kyle Van Noy. He can rush the passer and jump into coverage expertly, and should find a starting spot right away. The late-round guy to watch is Princeton defensive tackle Caraun Reid, a potentially dynamic three-tech interior penetrator. Few teams addressed obvious needs as aggressively and intelligently in this draft as the Packers, starting with first-round safety Ha Ha Clinton-Dix. The Alabama product can cover deep, and he's a great hitter from linebacker depth up. Three underrated receivers -- Fresno State's Davante Adams in the second round, Wisconsin slot man Jared Abbrederis in the fifth and Saginaw Valley State's Jeff Janis in the seventh -- should make Aaron Rodgers very happy. Cal tight end Richard Rodgers is the Jermichael Finley replacement -- a receiver who can flare wide and make plays. And Southern Miss defensive tackle Khyri Thornton will help a line in great need of young, tough talent. Ten selections, though most of the focus will fall on what Houston did at No. 1 overall (DE Jadeveon Clowney) and what it did not do from there on out (land a No. 1 starter at QB). Tom Savage had the Texans' eye all along, so they have to be happy they got him at 135. Since Clowney was close to a no-brainer, the real stars of the work done here came in guard Xavier Su'a-Filo atop Round 2 and in a trade-up for DT Louis Nix III in Round 3. Houston is a much better team than it was headed into Thursday, but will it matter without a surefire quarterback? The Colts started down in the count thanks to their ill-fated trade for Trent Richardson, which left them sitting around until pick No. 59. Their pick at that spot, Jack Mewhort, should bolster the offensive line but could need time to settle in if they move him to guard -- will the Colts regret passing on Gabe Jackson and Trai Turner because of that? WR Donte Moncrief should help an unsettled position group. Not much else of note. The Blake Bortles show. And that pick probably was the hardest to understand. Clearly, the front office believes Bortles can run the show for years to come. Getting both Marqise Lee and Allen Robinson in Round 2 was remarkable. With Cecil Shorts, they'll form a dangerous corp capable of shifting looks. Their next four picks all hit the mark: G Brandon Linder, CB Aaron Colvin (perhaps a Day 2 pick had he not injured his knee last season), LB Telvin Smith and DE/LB Chris Smith. One of the two Smiths could be the Leo linebacker Gus Bradley needs. Oh, and how about swiping Bortles' former UCF running back, Storm Johnson, in Round 7? Truly believe the Chiefs' best picks came in Round 5 (QB Aaron Murray) and Round 6 (OT Laurent Duvernay-Tardif). The rest of the group features guys that will have to fit into very specific spots, like Dee Ford as a situational pass rusher or RB De'Anthony Thomas as a Dexter McCluster-like weapon who will need Andy Reid to get creative in getting him the football. CB Phillip Gaines shows potential to be a lock-down guy down the road, and he may allow K.C. to trade Brandon Flowers now. It's a bit tough to get a handle on this effort. Miami picked an offensive tackle at No. 67, Billy Turner, who actually may be better than the OT it picked at No. 19, Ja'Wuan James. WR Jarvis Landry might be Ryan Tannehill's best friend, capable of going over the middle and hauling in tough catches. CB Walt Aikens also should contribute right away, and keep an eye on sixth-round WR Matt Hazel. The whole picture here just never fell into place from my perspective. On paper at least, the Vikings had one of the top drafts in 2014. UCLA's Anthony Barr was a slight reach as a pass rusher under development, but the team really scored by trading back into the end of the first round and grabbing Louisville quarterback Teddy Bridgewater. Their third-round picks -- Oregon State defensive lineman Scott Crichton and Georgia Southern do-it-all back Jerick McKinnon -- should provide valuable depth right away. And grabbing Stanford guard David Yankey in the fifth round could amount to highway robbery in a few years. An outstanding haul for first-year head coach Mike Zimmer and his staff. As critics of rather harmless endeavors like these grades will tell you, it really takes a good three or four years before any conclusions can be drawn on a draft class. Nowhere is that statement more true than in regard to the Patriots. The Tom Brady championship window is closing slowly, and yet New England may not have added a single player that will have a major impact in 2014. DT Dominique Easley has the best chance, both this year and beyond, if he's healthy, but he is still recovering from an ACL injury. A couple others, RB James White and WR Jeremy Gallon, might push their way into the lineup. Everyone else, most notably QB Jimmy Garoppolo, appears to have someone firmly planted in front of them on the depth chart. Having depth is a must. Did the Patriots miss out on the opportunity for more? Sean Payton's passing offense got a whole lot faster with the addition of Oregon State receiver Brandin Cooks in the first round; Cooks has the kind of game-breaking potential you might see in DeSean Jackson at his best. Nebraska cornerback Stanley Jean-Baptiste was a reach in the second round, but he does fit the prototype for the big, aggressive cornerback teams desire these days. Cal's Khairi Fortt is a thumping linebacker who should be perfect for Rob Ryan's defense, and Alabama safety Vinnie Sunseri, though limited, should be a good special-teamer. General manager Jerry Reese knew that he had to come away with a great draft class in 2014 -- the pressure was on after 2013's disappointing season. And the G-Men endeavored to give Eli Manning a blazing target in the first round with LSU receiver Odell Beckham Jr. He is one of the best receivers in this class and should produce immediately. Grabbing Colorado State center Weston Richburg in the second round was a nice addition, though they should have addressed more concerns along the O-line. The Giants seemed particularly enamored with the talents of Syracuse defensive tackle Jay Bromley and Boston College running back Andre Williams; Bromley in particular could be a pleasant surprise if his knack for quarterback pressure transfers to the next level. Maybe the Jets can trade a receiver to Cleveland for a cornerback. New York at least attempted to fix its chasm at corner, even if Dexter McDougle was a Round 3 reach and Brandon Dixon faces an uphill battle to make the squad. Though the Jets added three receivers (Jalen Saunders, Shaq Evans, Quincy Enunwa), the biggest new threat in the passing game is TE Jace Amaro. Safety Calvin Pryor definitely fits the mold of a Rex Ryan defense, as does seventh-rounder Trevor Reilly. Without question, this was one of Oakland's best drafts top-to-bottom in recent memory. OLB Khalil Mack will be the face of the defense, while QB Derek Carr could carry the same mantle on offense. G Gabe Jackson, DT Justin Ellis and CB Keith McGill all ought to play early. Even Round 7 produced a couple of worthwhile projects in CB T.J. Carrie and S Jonathan Dowling. This is how your rebuild a team. Chip Kelly's second NFL draft provided its share of surprises, with Louisville end Marcus Smith going in the first round. You'd be hard-pressed to find any analyst who had that kind of grade on Smith -- or anywhere close -- so that's one of those "wait and see" picks. The selection of Vanderbilt receiver Jordan Mathews in the second round was right in line, and will help right away. Kelly went back to his Oregon days twice, picking up receiver Josh Huff in the third round and defensive lineman Taylor Hart in the fifth. This draft will hinge on Smith's ability to provide elite edge rush. That's an undetermined idea based on his college tape, so the grade has to go accordingly. The first two rounds went down in typical Pittsburgh fashion: athletic LB Ryan Shazier in Round 1 and versatile DL Stephon Tuitt in Round 2. As with the rival Ravens, the Steelers focused right away on getting tougher up the middle -- a later pick of LB Jordan Zumwalt fell right in line with that approach. Then, an interesting shift landed human torch Dri Archer and 6-4 WR Martavis Bryant. The defensive line and linebacking corps improved, and a couple of much-needed additions were made at receiver. That's all well and good, except the Steelers barely touched their offensive line (OT Wesley Johnson in Round 5) or secondary (CB Shaq Richardson, also in Round 5). Loved the start, which featured CB Jason Verrett at No. 25 and OLB Jeremiah Attaochu at No. 50. The rest of San Diego's work was a little humdrum, albeit need-based humdrum that landed G Chris Watt and 337-pound NT Ryan Carrethers. Seventh-round WR Tevin Reese should have a chance to speed his way to playing time, if he proves a viable deep threat during camp and into the preseason. I wish I could say RB Marion Grice will have the same chance. Unless he wins a kick-return job, though, the talented back will be stuck behind Ryan Mathews, Danny Woodhead and Donald Brown in the backfield. If that happens, the Grice selection will not have made much sense. Armed with a flood of picks from the third round on, and with the knowledge that they've hit on just one starter (safety Eric Reid) in their last two drafts, the 49ers knew that they had to hit bigger. They certainly did in the first round with Northern Illinois safety Jimmie Ward, a special player who can also line up at corner and slot corner. Second-round running back Carlos Hyde presents the best power/speed combination in this class, and he fits San Francisco's offense perfectly. A few notable steals: South Carolina receiver Bruce Ellington in the fourth round, South Florida end Aaron Lynch in the fifth and Wisconsin linebacker Chris Borland in the third. Through sheer odds, it's tough to imagine general manager Trent Baalke striking out as he has in recent years, and there's a lot of talent here. As usual, the Seahawks drafted unconventionally, ignoring need at times in favor of players with specific athletic skills. The lack of a dominant guard could come back to bite them later, and I'm not totally sold on the prospects of second-round offensive tackle Justin Britt. However, getting Colorado speed receiver Paul Richardson, also in the second round, could be a major steal. Alabama's Kevin Norwood, a bigger target for the end zone and the red zone, adds a key component to Seattle's offense. UCLA defensive lineman Cassius Marsh, who committed to Pete Carroll back in the USC days before changing his mind, reunites in an end/tackle role. Watch out for Marshall offensive tackle Garrett Scott as the possible sleeper pick -- he has a lot of the qualities you'd like to see in a top-flight pass-blocker. I have to knock Seattle down for passing on the two best guards in this class -- Xavier Su'a-Filo and David Yankey -- because it is a position of enormous need that wasn't sewn up in free agency, either. Obviously, the seventh-round pick of Missouri defensive end Michael Sam will get all the press, but realistically, Sam is little more than a backup for Chris Long. At the top of their draft, St. Louis scored two immense hits with the additions of Auburn left tackle Greg Robinson and Pitt defensive tackle Aaron Donald. Both were seen by many to be the best players at their positions, and any time you can do that twice, it's a big deal. The Rams also took running back Tre Mason, who gained 6.5 yards per carry running behind Robinson last year, and Missouri cornerback E.J. Gaines was a nice get in the sixth round. The only possible knock on this draft is that Florida State cornerback LaMarcus Joyner doesn't really look like a second-round talent, but with the first round St. Louis had, we're splitting hairs. After acing free agency like no other team, the Bucs started out hard in the draft, bagging Texas A&M receiver Mike Evans and Washington tight end Austin Seferian-Jenkins with their first two picks. Adding them to Vincent Jackson will give Tampa Bay's quarterback -- whoever he may be -- all kinds of tall targets. Running back Charles Sims is a player with interesting potential who might find himself in a rotation with Doug Martin, and a lot of people think that Tennessee State guard Kadeem Edwards is one of the more underrated blockers in this class. Purdue OT Kevin Pamphile, taken in the fifth round, is a personal favorite based on his tape. He doesn't have a lot of experience, but could be great with the right coaching. Willing to cut the Titans a little more slack than in the immediate aftermath of the Taylor Lewan pick. He probably can beat out Michael Oher on the right side, or the Titans can move on from Michael Roos and hand over the blindside. It's still a surprising decision given what was on the board at 11, but perhaps there is vision behind it. RB Bishop Sankey probably will be the starter before long, and DT DaQuan Jones offers another talented option for a transition to the 3-4 defense. Tennessee will be fortunate to get a starter from the remainder of its draft, and that includes QB Zach Mettenberger, who slipped to Round 6. Mettenberger's injury woes and a reported failed drug test at the combine hammered his stock. The Redskins were left without a first-round pick yet again as a consequence of the Robert Griffin III trade, but recovered decently in the second round by selecting Trent Murphy, a seriously strong defender with amazing potential. They reinforced the offensive line with Virginia offensive tackle Morgan Moses and Nebraska mauling guard Spencer Long, both in the third round, and got a very interesting sleeper in the person of Baylor back Lache Seastrunk, who could replace Roy Helu as the team's satellite runner. Given their handicap up top, not bad at all.